With the release of the new updated version of GLBenchmark 2.0 for smartphone’s its been revealed that the Hummingbird processor, a 1 GHZ ARM Cortex A8 chip and PowerVR SGX 540 GPU is the fastest smartphone chip currently available. 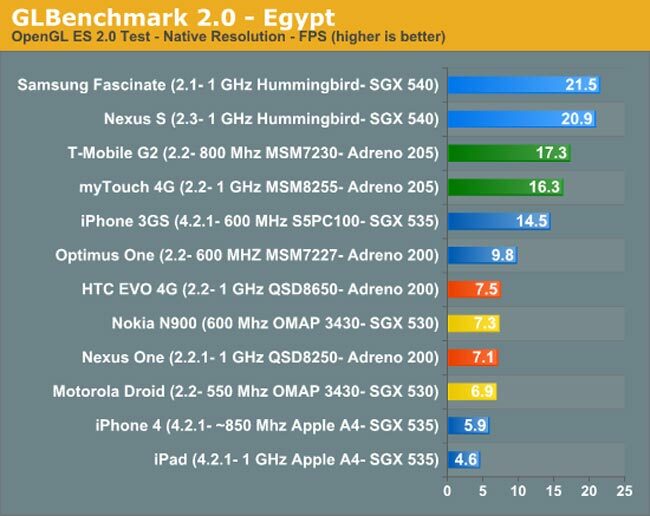 You can also see from the table below that the Qualcomm made Adreno 205 graphics processor is nearly as fast as the PowerVR SGX 540 and multiple times faster than the older generation Adreno 200 GPU which was introduced in the Nexus One. Samsung has also stated that the GPU in their Orion dual core processor is 5x faster than the one bundled with Hummingbird which should provide a huge amount of power to these pocket devices. More information on the new GLBenchmark 2.0 software can be found here.